Transform Now Plowshares is ONLINE!!! Check out the brand new Website and Blog for Transform Now Plowshares by clicking here! It’s been set up by that maven of Plowshares journalism, Chrissy Nesbitt. I have been fortunate to work with Chrissy on all things media-related to Disarm Now Plowshares, and we can count on more good work from her in this new endeavour (and believe me, it’s a long road ahead). Editor’s Note: This is the action statement the members of Transfrm Now Plowshares carried in to the y-12 nuclear weapons facility on July 28th. Editor’s Note: Many thanks to Ralph Hutchison, of Oak Ridge Environmental Peace Alliance (OREPA), for his fine reporting of today’s arraignments. Editor’s Note: Thanks to Ellen Barfield for this narrative. We will continue to post information and updates on transform Now Plowshares here at Disarm Now Plowshares Blog. Michael R. Walli (63), Megan Rice shcj (82), Greg Boertje-Obed, (57), succeeded in a disarmament action at the Oak Ridge Y-12 Nuclear facility before dawn. Susan Crane was in U.S. District Court, Tacoma, Washington on July 23, 2012 where she was given 60 additional days of prison time for her noncooperation with the conditions of supervised release. Here are some photos from the day along with music (The Ballad of Disarm Now Plowshares) by James Morgan. Judge Settle told Susan to report to prison when she is notified by the probation officer, which is likely to be some time in September. We hear about angels in scripture, and angels are often called the felt presence of God. When people have done various plowshares actions, they have often found gates unlocked, doors open, unexplained unguarded areas, and security systems that inexplicably don’t work. Could this be described as the help of angels? When Steve Kelly, SJ, and I walked into the Lockheed-Martin plant in Sunnyvale, we were hoping to convert on of the Trident D-5 missiles that are deployed on the Trident Submarines. We didn’t know if we would be able to get into the building where the D-5 missiles were being built. As we climbed over the fence, there were some smokers outside who seemed to be looking at us–which was not in our plan! But as we walked up to the building, a large bay door opened in front of us! We walked right in! In telling this story, I often think that if we were living when Acts was being written, we would say that an angel opened the door! And, how can we explain how we got onto the Naval Base Kitsap/Bangor? How was it that we were able to walk on the base for four hours without anyone questioning us? How was it that we walked along the roads, and car after car, and even military convoys, passed us. We were carrying bolt cutters, not concealing anything. A couple of days ago, Fr. Louis Vitale was walking around St. Boniface Church in San Francisco telling me the stories of the people in the statues and stained glass windows there. 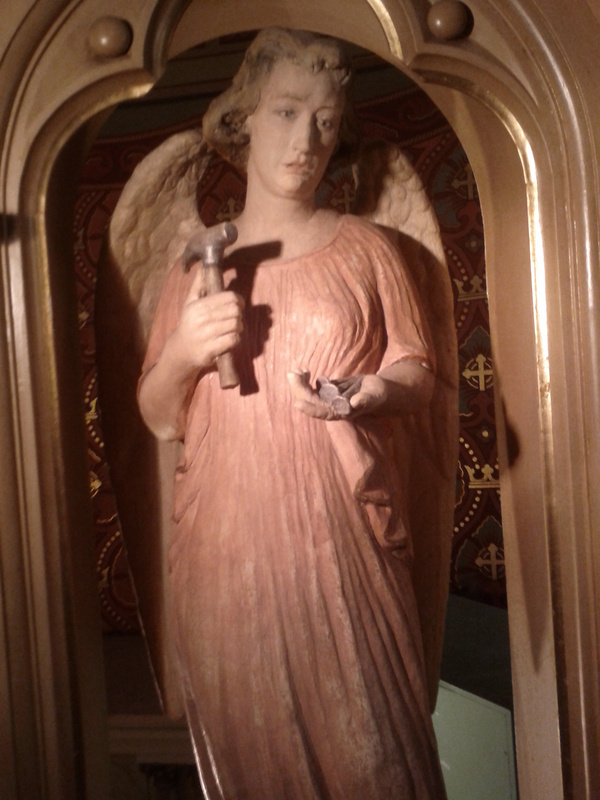 Above the altar, there were several statues of angels, and one of the angels had a hammer! Today the angel would likely use the hammer to continue the conversion process of turning modern day swords into plowshares, and the nails to seal the nuclear weapon bunkers shut. Thanks to Dennis Duffy for the photograph.